The great gelato quest continues, and indeed concludes, in Bologna. 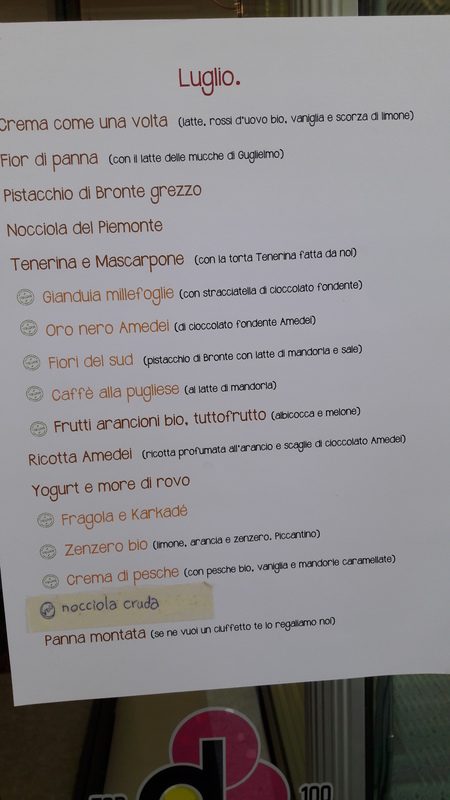 For any gelato afficianado out there, I would strongly recommend following our route travelling east across Italy rather than the reverse: our gelato journey basically improved at every stop along the way. I would have been devastated to start with this great gelato in Bologna and see my options dwindling down as I made my way back to Milan. We only went to two gelaterias in Bologna, but they were very good indeed. We started out at Cremeria San Francesco, a nice place in a quiet square, a little away from the centre. 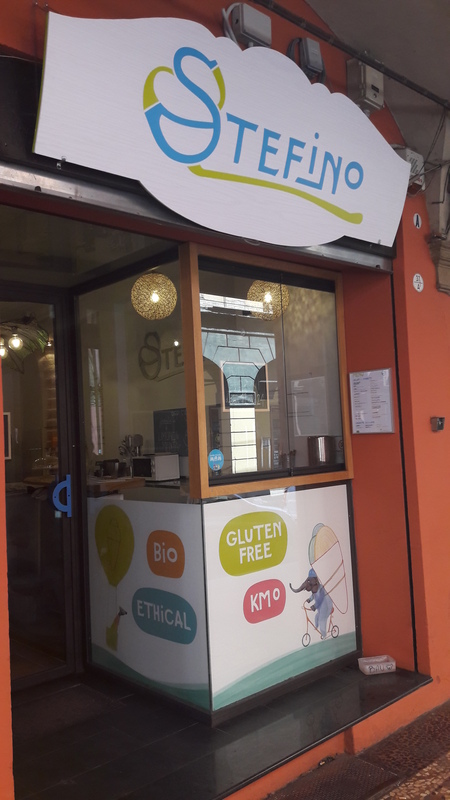 This was perhaps the most vegan-friendly gelateria we visited: they even had vegan brioche for the beloved gelato-in-brioche dish (I wasn’t that excited by it, surprisingly). I think only one of their cones was vegan though, so do specify when you order. Above is the menu from July: you can see a lot of vegan options there, and some quite exciting flavours. I got the gianduia one, which was really rich and creamy and had dark chocolate chunks. 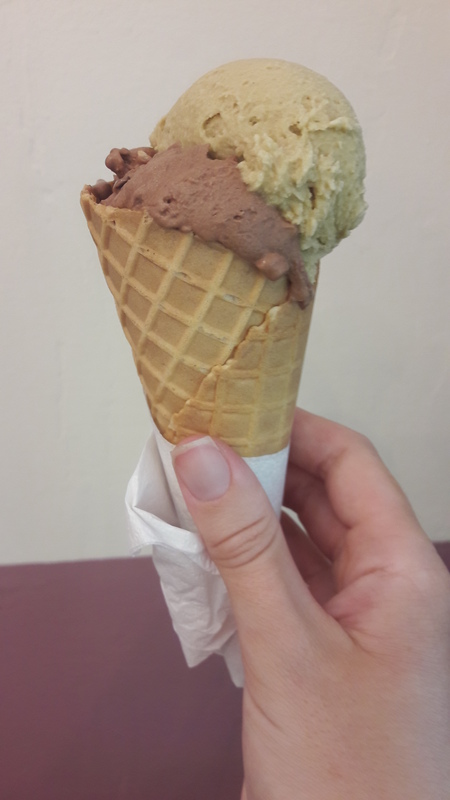 I paired it with the salty pistachio, which was the most flavoursome gelato I had throughout my whole stay. It was sublime! Dr HH and I both agreed that this place provided the best gelato of the two weeks. Bravo! Next stop: Stefino Bio. This place was more central, and also had plenty of vegan options, including some exciting ones: lemon and basil, chocolate and curry (?!). 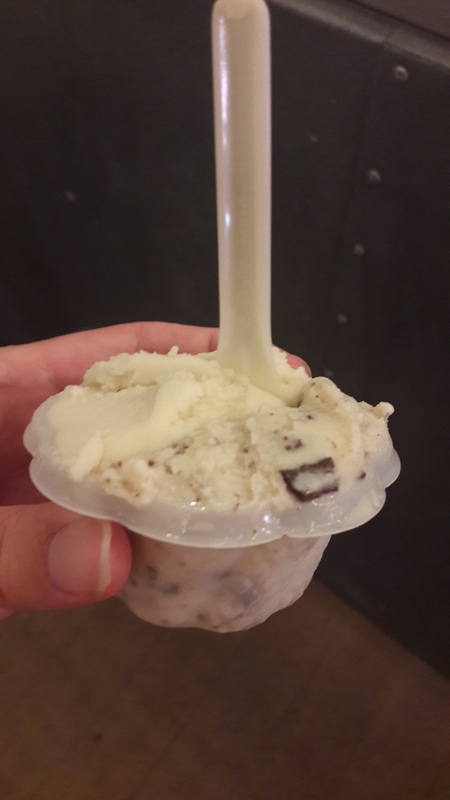 I decided to play it relatively safe, and chose the two flavours I’d been hoping for all through the holiday and finally found right at the end here: coconut, and mint choc chip. The coconut was good, and the mint choc chip was great! I wish it had been green, but that’s a minor quibble. 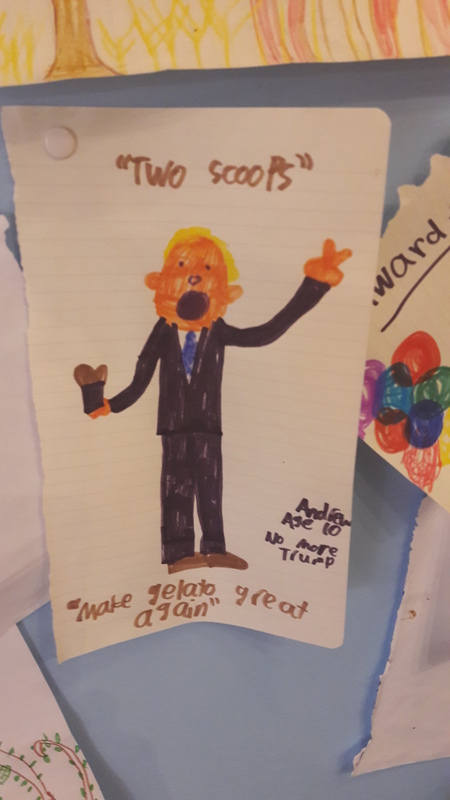 And as if we didn’t already love the Bologna vegan gelato scene enough, check out this artwork left behind by some children at the colouring table! This entry was posted in Travel, Vegan Mofo and tagged vegan Bologna, vegan gelato Bologna, vegan Italy, vegan travel, veganmofo, vgnmf17. Bookmark the permalink. I would definitely want to try the mint chocolate chip gelato! 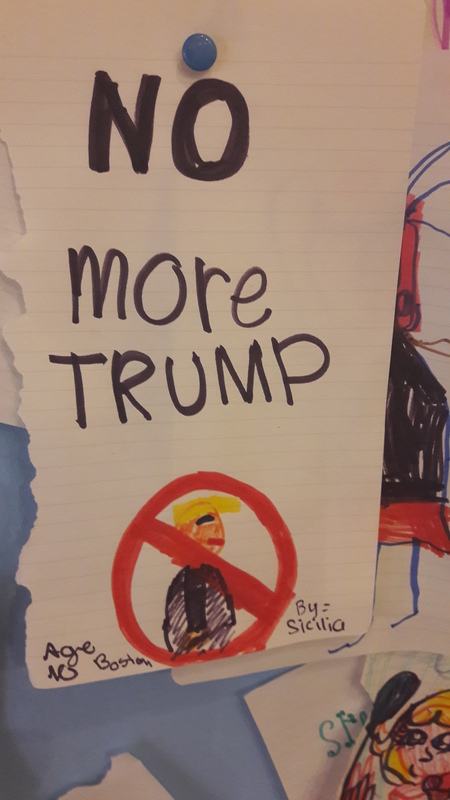 Love the artwork, too, haha! Yes, that place was a hit all-round! 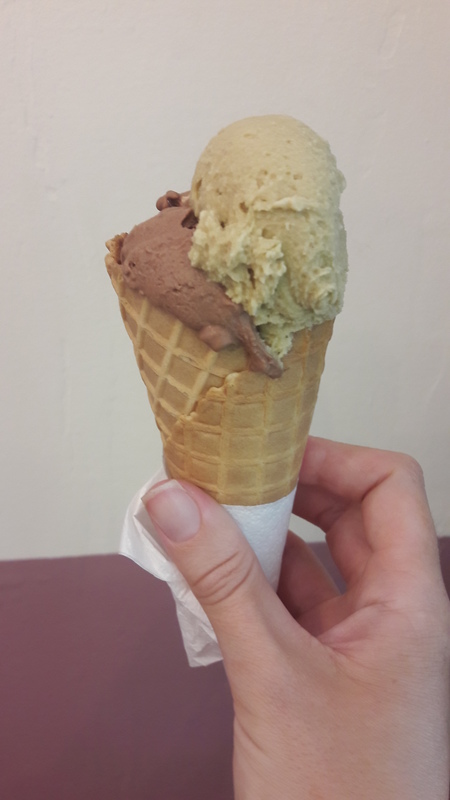 Just reading about the pistachio gelato made me want to get back to Italy asap! I betcha the chocolate curry is yummy. It makes me think of the “mexican” chocolate with a little hot pepper and cinnamon. Yes, when I was thinking about it later I realised it was probably chilli and chocolate, and the translation was just a bit off-putting!